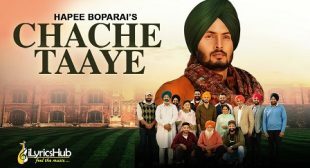 Chache Taaye Hapee Boparai Lyrics Its music is given by Laddi Gill while Lyrics of new Punjabi song penned by Kabal Saroopwali. 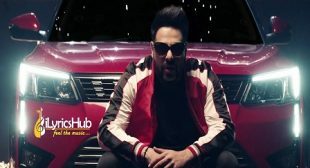 Jaan Lyrics – Karaj Randhawa New Punjabi Song sung by him with lyrics penned by Prince Rakhdi. This song is composed by The Kidd. While it is released with GeetMP3 Music Label. Jaan Lyrics by Karaj Randhawa feat Himanshi Khurana is Punjabi song written by Prince Rakhdi. Music given by The Kidd and video directed by Tru Makers. 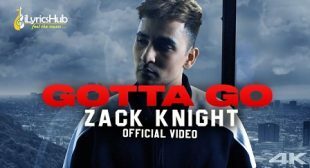 Gotta Go Song Lyrics – Zack Knight is back with bang Gotta Go Song sung, written and composed by him while it is released with Revolve Records Music Label. Gotta Go Zack Knight LyricsThe Music and Lyrics of the new Punjabi song is also given by Zack Knight while Guitar played by Rob Higgins. Set The Roads On Fire Lyrics sung by Badshah featuring Sonal Devraj for Mahindra XUV300.music and lyrics of new song is also given by Badshah.